I’ve had a busy year working on a wonderfully imaginative poetry and dance project called ‘In the Hands of the Boys’. This Shropshire project exploring the life of Wilfred Owen took place across half a dozen different schools, bringing contemporary dance and poetry to children, and boys in particular. I’ve been in various primary schools in Shropshire doing local heritage and poetry work (among other interesting things), and of course I’m still Poet in Residence at the wonderful Hargate Primary in West Bromwich. Work has been completed now on Impressions of the Past, an AONB led community arts project about Shropshire’s Iron Age hillforts, in collaboration with clay artist Ruth Gibson. And for a fascinating month I was Writer/Blogger-in-Residence for the Museum of Cannock Chase. ‘In woods we forget things, at the wood edge we tell stories‘was a project funded by Shropshire Hills AONB and Shropshire Housing Group. This project took three different groups of children and young people, and enabled them to write site-specific poetry in three different native woodlands. I teach for The Poetry School and on the Learning and Participation programme at The Hurst for Arvon. With Wenlock Poetry Festival I worked on Two Sides of the Severn. I am Poet in Residence for Hargate Primary School, West Bromwich, which is a real joy, and regularly visit the school to enjoy poems, read poems and make poems with all age groups. I continue to work regularly in nursing homes and day centres with elderly people, making poetry, often with those living with dementia, and work on social prescription-based projects such as Songs of the Trees and Words on the Water, which aim to provide creative opportunities and reduce isolation for older people. I also lead the Spark Young Writers group at Telford, which meets once a month and is managed by Writing West Midlands. In May 2013 I also developed and completed ‘Poetry Partners’ a month of intergenerational poetry celebration of the Woods of Cree, working with a primary school and a day centre. 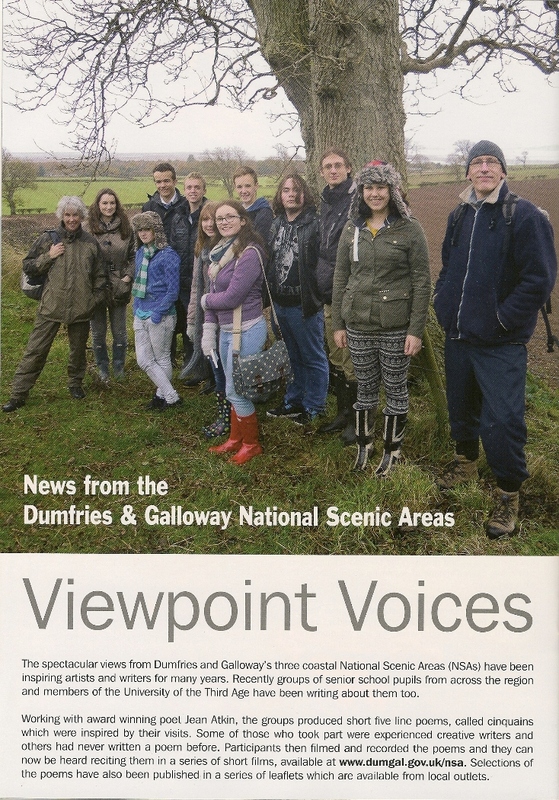 I’ve also been Poet in Residence for Dumfries & Galloway Science Festival, and worked with National Scenic Areas Dumfries & Galloway on the year-long ‘Viewpoint Voices’ project with groups of different ages on the Solway coast, walking and writing short poems with them, which were spoken by the participants and posted online as short videos. From 2013 to 2015 I was one of a team of poets mentored by John Killick with In The Pink, an award-winning project using poetry to work with people living with dementia in Herefordshire. On the first Tuesday of every other month, I organise The Poetry Lounge in The Sitting Room in Ludlow – a popular open mic night with guest poets.